VidIQ’s Real Time Stats Bar Tool does just what it says on the tin. 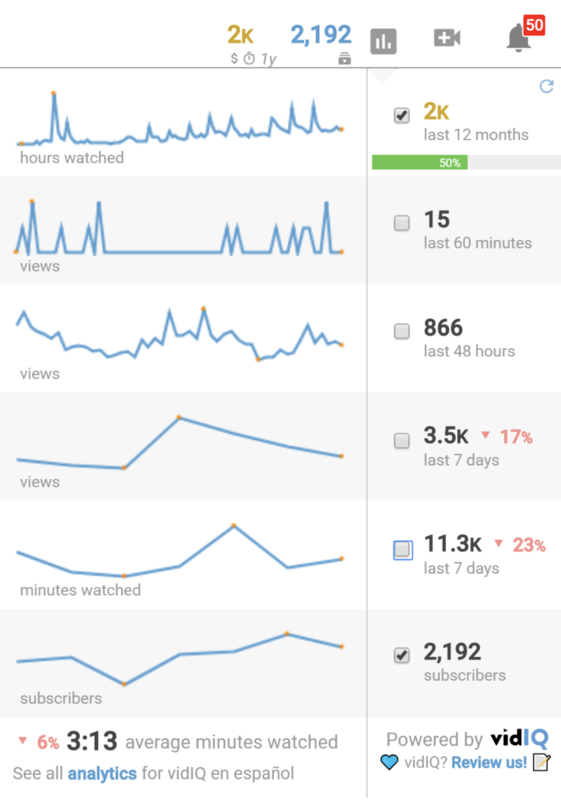 It makes YouTube stats and data a bit more accessible so you can quickly get to the information you need. This easy to access tool quickly shows you how far you are on the road to monetization and other high level stats. Just hover over the ‘Graph’ button in the top right-hand of your browser to reveal real time views in the last 60 minutes, 48 hours, and 7 days. You can also see minutes watched in the last 7 days (Watch Time is THE most important ranking factor on YouTube so you’ll want to keep a close eye on this), plus how many total subscribers you have. At the top it shows you how close you are to the 4,000 hours needed for monetization. Mousing over the graph drills down into the data even further to bring you minute by minute views - and you can set the feature to appear wherever you are, and whatever you are doing on YouTube at the time. Just tick the check boxes on the right hand side for the stats you also want to hand.